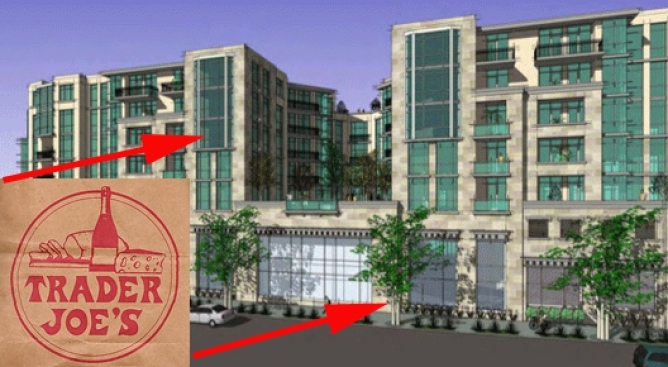 Developer Rick Caruso's Burton Way development, a project that would add a Trader Joe's below 88 apartments at Burton Way and La Doux Road was approved (with some conditions) yesterday by the planning and land use management committee yesterday, a move which sends it to the full city council vote. We listened in to yesterday's meeting, and a least one of the public supporters mentioned the need for a grocery store in the neighborhood. The Los Angeles Times also recently covered the project, noting that the project has "been widely praised by residents who welcome the project as a smart addition to the neighborhood." Caruso being Caruso, surely he charmed the pants off these locals. The Times story also mentioned the Wetherly project, which is now officially cast as the bad building (too big!) in this Burton Way-area development game (a decision on that project was delayed at yesterday's Planning and Land Use Committee meeting). Also, it looks like original See's Candy shop in Koreatown (it's slated to be torn down for a mini mall) could indeed be saved as the committee moved it closer to its historic-cultural monument status.